The England Parliament bans public stage-plays. The major closing was the banning of theatre at the start of the English Civil War. On September 6, 1642, by an act of Parliament, all theatres in England were closed. This meant specifically that the great playhouses and theatrical companies of London, many of which had survived since the Elizabethan age, ceased operations for good. The stated reason behind the ordinance was that attending theatre was “unseemly” during such turbulent times. The real reason, of course, was that the playhouses had become meeting places for scheming Royalists. Their Puritan rivals, who controlled Parliament, simply couldn’t have that. So theatre was banned. Within a few years most of the grand old structures, now abandoned, had decayed beyond use or were dismantled altogether–leaving no visible trace of the playhouses of Shakespeare’s day. Theatre would remain illegal until the end of the Interregnum in 1660, when the Puritans lost power and the monarchy was restored. Almost immediately, playhouses reopened and theatrical entertainments resumed. Theatre returned full force with the Restoration leading to a revival of English drama and performance that paved the way for the great age of acting and wit during the 18th century. Coincidentally, it was also on this day that theatres reopened. On September 6, 1919, the great Equity Strike came to an end at 3 o’clock in the morning when Broadway producers finally reached an agreement with the upstart actors’ union. The strike lasted a month and closed nearly 40 major productions across the city, with revenue loses in excess of $3 million. The two sides reached a five-year deal that finally recognized Equity as the professional actors’ union. Over the next few years working conditions improved and Broadway flourished. The good times lasted only until the 1928 season when there was a noticeable dip in attendance and profits, a decline that some historians attribute to the rise of “talkies.” Of course, the next year things hit the skids big time as the stock market crash in October put Broadway in a tailspin and reset the commercial theatre’s entire economic picture for the next several decades. In many ways the professional stage never fully recovered. But Actors’ Equity remains, still setting the standard for professional theatre across the country. Swaziland became independent on 6 September 1968 and joined the Commonwealth. In 1973, the King repealed the independence constitution, abolishing parliament and all political parties. The tinkhundla system of government was introduced in 1978 and overhauled in 1993 (see Constitution). When the King died in 1982, there was a four-year delay before Prince Makhosetive acceded to the throne as King Mswati III in 1986. From the mid-1980s there was building pressure for a return to multiparty democracy. The reintroduction of universal adult suffrage in 1993 only served to increase this pressure. There was from the mid-1990s a succession of strikes organised by the Swaziland Federation of Trade Unions and increasingly public activity by opposition movements. 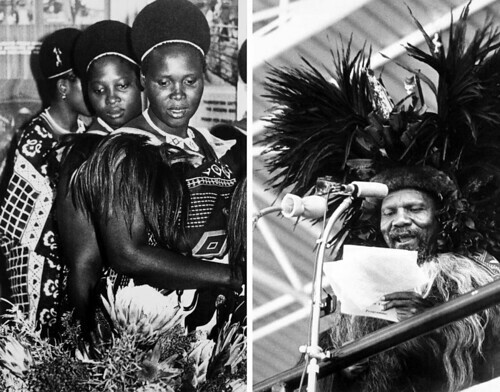 A Constitutional Review Commission was set up in July 1996 to solicit the views of the Swazi nation on the type of constitution the people wanted, by visiting all the constituencies in the country and then submitting a report, including a draft new constitution by 1998. Elections for pre-selected candidates were held in October 1998. About 60% of the registered voters cast their vote. The King confirmed Dr Sibusiso Barnabas Dlamini as prime minister. Most of the 16 ministers were royal appointees rather than elected members of parliament. The Constitutional Review Commission finally presented its report to the King in November 2000, but it was not published. In 2001 the King attempted to give himself additional powers to contain the pressure for constitutional reform but climbed down in the face of national and international protests. In August 2001 he called a national gathering and the Commission’s chairperson announced – to an audience of only about 10,000 people (the last national gathering was attended by 250,000) – that the King’s powers were to be enlarged but gave no details of the fruits of the five-year review. Subsequently the King set up a new commission to draft a new constitution and the draft was released in May 2003. However, under this constitution the country was to remain an absolute monarchy and, though freedom of assembly was to be allowed and the ban on political parties therefore technically lifted, under the continuing tinkhundla election system there is no role for parties. British troops defeat the US troops in the Battle of Groton Heights. The name ‘Saint Petersburg’ is given back to the Russian city, which had been previously known as Leningrad since 1924. The Battle of El Mazuco during the Spanish Civil War starts. The first of Blackfriars Ships dating back to the 2nd century AD are discovered in the banks of the River Thames in London. The ferry SuperFerry 9 sinks off the in the Philippines with 971 persons aboard. Only ten are rescued. The funeral of Diana, Princess of Wales occured in London. Over 1 million people lined the streets and 2.5 billion watched around the world on television.